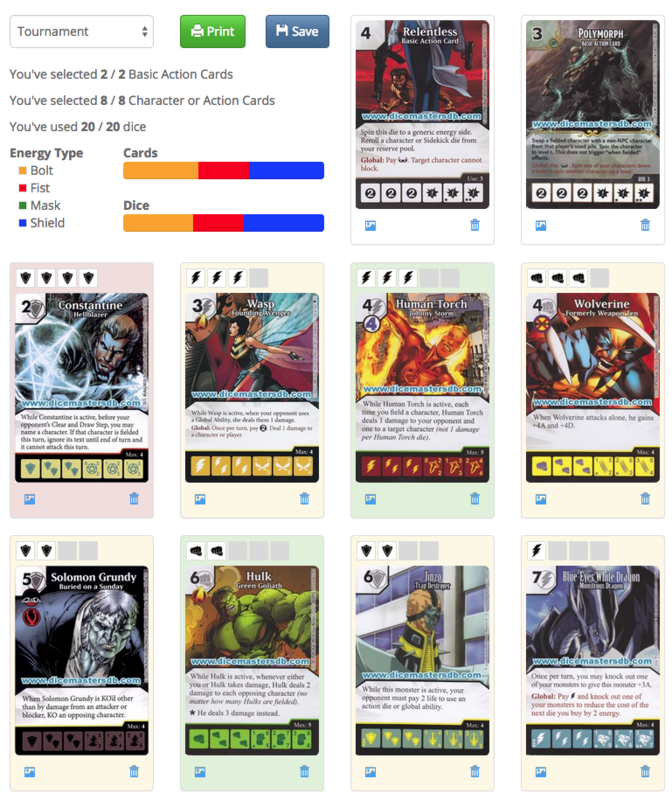 I'm pretty new to dice masters (only been collecting/playing since AoU's release). Thanks to some trades and amassing store credit at coolstuffinc from selling off a bunch of my M:tG cards, I've been able to track down some cards I'd been coveting. I want to play with some of my new toys (Jinzo, BEWD, Constantine, Gobby, and Tsarina), and this is a quick list of what I've come up with so far, and my thoughts on them. BEWD and Grundy are there for spot removal. I'm trying hard not to constantly lean on PXG, and am still a little worried about my ability to ramp properly without him. Constantine, Jinzo, and Wasp are there as control & global punishers, since my local scene seems to rely heavily on PXG. Hulk's there as my board clear. Wolverine's basically just another win con. I figure between Hulk and Relentless, I should be getting him through somewhat reliably. And I have to admit, I have a soft spot for the card. As a child of the 90s I fondly remember watching the X-Men cartoon Saturday mornings and he was by far my favorite. How's the team look? What might it be weak against? 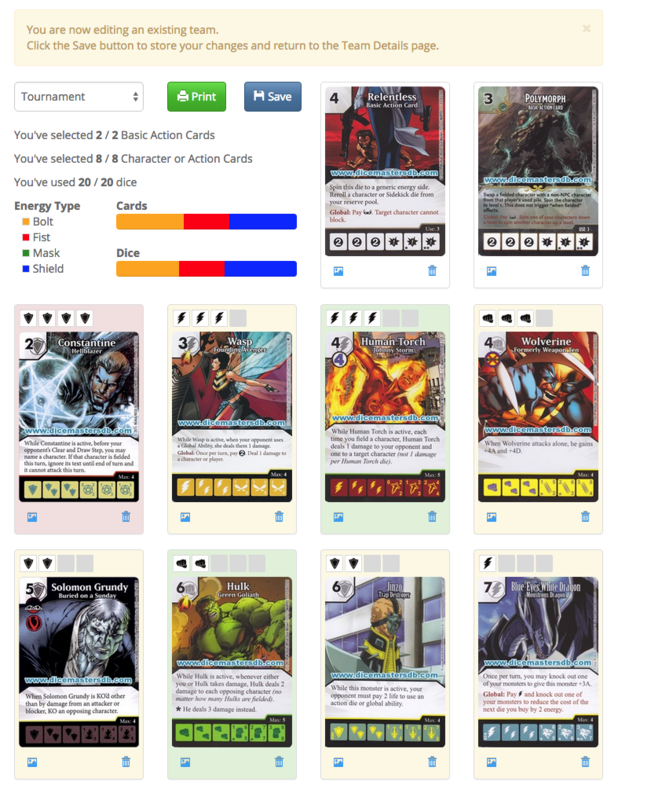 The two cards I seem to be on the fence most about are Human Torch and Wolverine. I can't seem to decide between leaving them there or taking them out for Human Paladin and Doomcaliber Knight (either common or uncommon). Team looks good. The teams heavy set on offense so I would suggest taking out Jinzo and putting in Professor X - Recruiting Young Mutants/Trainer. You have the option to field clear with Hulk and then swing in with Wolverine, added with Relentless forcing the living characters not able to block. Professor X grants you that ramp to build enough masks and extra energy to ping Hulk once with Wasps Global. Human Torch isnt really needed here unless you plan to ping away your opponent with fielding side kicks and hitting hulk with the 1 damage to field clear. But if it were my choice I would take out Human Torch and put in DoomCaliber Knight - Fiendish fighter. Your teams old school. I noticed that you said your local store uses PXG heavily so if not, just take out Jinzo and put in DoomCaliber Knight - Fiendish Fighter. Distraction and Transfer Power are Wolverines kryptonite. Do you think that between Relentless and Doomcaliber Knight's global I'd be investing too much stock into getting Wolverine through? I'm not entirely sold on Human Torch being on the team, but without him my only way of reliably pinging Hulk would be with Wasp's global (unless my opponent's got Magic Missile or something else). Which would you sub out first for DCK? Jinzo, or Human Torch? Last edited by jhaviland; 09-30-2015 at 05:06 PM. Jinzo. Your teams aggressive. You can sub him out and if you feel better you can have the rare slifer for its global. Is PXG necessary? I have yet to play test the team, so I don't know whether BEWD by itself will be sufficient ramp. What about Gobby as an option to sub in for Human Torch or Jinzo? The bolts fuel BEWD and fielding Gobby over and over could provide decent burn. If you're going for Gobby you might as well play Deans World Champ team. PXG is necessary for Wolverine. He uses a lot of resources.